We tend to think that there was a time in America when invention was a solo game. The picture of the lone entrepreneur struggling against the odds to invent the next big thing is an enduring theme, if a bit inaccurate and romanticized. Certainly many great inventions came from independent inventors, but the truth is that corporate R&D has been responsible for most of the innovations from the late nineteenth century onward. But sometimes these outfits are not soulless corporate giants. Some are founded by one inventive soul who drives the business to greatness by the power of imagination and marketing. Thomas Edison’s Menlo Park “Invention Factory” comes to mind as an example, but there was another prolific inventor and relentless promoter who contributed vastly to the early consumer electronics industry in the USA: Powel Crosley, Jr. Although Powel Crosley’s fortune would be made with radio, his first love was the automobile. At the turn of the 20th century, a thirteen-year-old Crosley started building his first car. His father, a prominent Cincinnati lawyer and clearly a man of means, bet the princely sum of $10 that his son couldn’t complete the car. Powel enlisted the help of his brother Lewis, and together they finished the car, complete with a hand-built electric motor. They won the bet and began what would turn into a long business partnership. College eventually beckoned, but Powel’s interest in cars distracted him enough that he dropped out after a couple of years. He tried various automotive ventures with mixed results; while starting a car company was his dream, he seemed to be more adept at inventing various small gadgets for the burgeoning car culture in America. By 1919, Powel and Lewis had amassed a two million dollar fortune and began to look for opportunities in other parts of the growing consumer markets. The big growth industry in the 1920s was radio, and it was clear to the Crosley boys that there were fortunes to be made in the new field. But radio was still new, and even a rich man like Powel would balk at the $100 price tag for a store-bought set. So when his son asked for a radio, Powel chose the hacker way – he bought a book on radio so they could build one together. Intrigued by radio’s potential and with the resources of a manufacturing operation to draw on, Crosley was soon selling complete radio sets. By 1924, Crosley was the biggest radio manufacturer in the world, and in 1925, their iconic “Crosley Pup” radio hit the market. A simple one-tube regenerative receiver, the Pup brought radio to the masses. 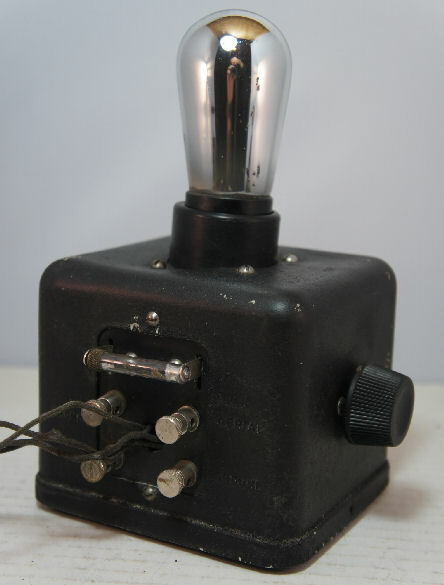 Its $9.75 price point was possible because of its low parts count – the tube acted as both amplifier and detector, a simple LC tank circuit tuned the radio, and a “tickler coil” could be manually adjusted to feed part of the amplified RF signal back to the tuned circuit and create a positive feedback loop to further amplify the signal. Thanks to a brilliant marketing campaign using Powel’s dog Bonzo as a mascot, the Pup was a consumer hit. But Crosley wasn’t satisfied, and saw trouble brewing on the horizon. 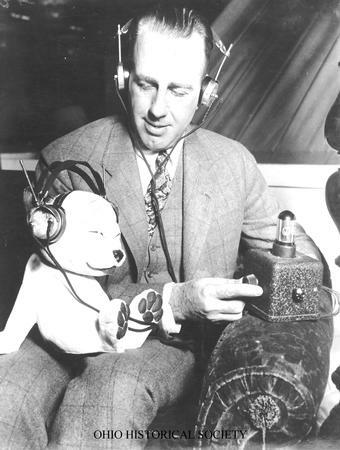 His Pup radio was threatened by a simple fact – there just weren’t that many radio stations on the air at the time. Those that were on the air were generally low-power broadcasters, which also posed a problem for the Pup – it wasn’t a particularly “hot” receiver given the sacrifices made to keep the price affordable. Powel’s answer to the problem is a classic of early 20th-century capitalism and a model of vertical integration: he would build his own radio station. In the much simpler regulatory environment of the day, Powel had been experimenting with radio broadcasts since 1921, and in 1922 station WLW began operation from Cincinnati on 700 kHz. Radiating a measly 50 watts at first, Crosley began goosing up the power over the years, on the theory that the more power he used, the cheaper he could build his radios. First 500 watts, then 1,000 watts by 1924, and 5,000 watts the next year. In 1928, Crosley increased WLW’s output to 50,000 watts, making it the most powerful radio station in the world. It could be heard from New York to Florida on a clear night, but Crosley had his sights set higher. Much higher. In 1933, construction began on a 500,000 watt amplifier for WLW. It’s not clear that there was a valid business justification for taking WLW to ludicrous power, since about 90% of the population of the United States was already in range of WLW at 50 kW. But Crosley was on a tear – 1934 was also the year he purchased the Cincinnati Reds baseball team. So hubris no doubt played a part in WLW’s power boost. But that hubris came at great expense. A new electrical substation devoted exclusively to WLW had to be constructed, as did ponds to cool the water used to handle the heat from the amplifiers. Gigantic antennas sprouted from the WLW campus in Mason, Ohio, and in January of 1934, WLW began broadcasts at half a million watts. The complaints began pouring in almost immediately. WLW was blasting other stations off the air, with Toronto stations being particularly vulnerable. By December of 1934, WLW was required to reduce its nighttime emissions back to 50,000 watts while it worked on solutions to the interference problem. New antennas were built and were fed out-of-phase signals to shape the radiation pattern enough to solve the Toronto problem, and WLW was turned back up to full power around-the-clock operation in 1935. But WLW’s days as the most powerful radio station in the world were numbered. As is often the case with new technologies, politicians finally saw something that could be regulated and in 1938 passed legislation banning broadcast stations over 50,000 watts. WLW’s 500-kW license expired and the Cincinnati Flamethrower was back to the new 50 kW legal limit, where it still operates to this day. Even at this level, WLW can still be heard at night in 38 states. Since Crosley had plans to take WLW to 750,000 watts before Congress got involved, it’s safe to say that he was disappointed by what became of his baby. But Crosley was never one to rest on his laurels, and while radio remained a huge focus of his business – he would own WLW until after WWII – he had many other business interests. He was a pioneer in home refrigeration, inventing a kerosene-powered fridge for use in rural homes without electricity and putting the first shelves on the door of a refrigerator. He invented the concepts of night baseball and play-by-play radio broadcasts, both of which increased revenues from his Cincinnati Reds so much that all Major League Baseball franchises soon copied his model. Cars, radio, sports, appliances, airplanes, even early TV broadcasts – Crosley had a hand in almost every major piece of the 20th-century’s consumer culture. ← Will Your CAD Software Company Own Your Files, Too? According to Wikipedia the Crosley Corp. has no association with Powel or anyone else w/ the surname Crosley. Some company bought the naming rights in the mid 70’s. Then the corporations hide behind it and sell the worst of produced electrical goods to the masses who still believe the company has that track record behind them. If only there were reset counters for this type of thing in a way to take from them what they take from us. Crosley had problems in 1946-1948 with their “cobber-brazed” CoBra engine. Its block was made of arounf 125 steel stampings that were press fit and spot welded before being copper brazed in a specially constructed 60 foot long furnace at 2060 degree F in a neutral atmosphere. The completed blocks weighed only 14 pounds and were bolted between an aluminum crankcase and cast iron head. The engine design had been manufactured by Crosley to power air dropped generators for the US military. The water jackets were first coated on the inside with plastic, then later ones got a zinc coating. Running them low on coolant caused warping and any failure of the water jacket lining allowed galvanic corrosion to have fun with the salt based anti-freezes of the day. It’s surprising that an auto manufacturer hasn’t revived this technology. With newer metals for the block parts and brazing, plus better coatings for the water jacket and corrosion inhibiting coolants it could make very durable engine blocks at a much lower cost and lighter weight than aluminum. I strongly doubt that this process could be made less expensive than current aluminum casting or provide a superior product given the tolerances that must be maintained in a modern ICE. Block and head were all one assembly, head was not removable and was also fabricated out of steel. http://crosleyautoclub.com/Mighty_Tin.html for more info. It boggles my mind that the Westinghouse name is on both nuclear reactors and junk-electronic TVs. Gawd, I recently saw a cast iron skillet, marketed under the Westinghouse brand. Isn’t this basically what the Wardenclyffe tower was intended to do? Wardenclyffe was suppose to shoot down German Zeppelins. Quatman café in Mason has some of the best cheese burgers ever. The place is no frills and is very mom-and-pop. But man their food is good. The WLW tower is something to behold as well. My high school electronics instructor had previously owned a Crosley automobile. Maybe more than once he was told that tavern/bar patrons had carried his car up the courthouse steps and left it there for him to figure out how to get it down. Some protective Crosley owners would glue sharp objects under the bumpers. The nicer ones glued hacksaw blades. I remember well built steel kitchen cabinets with hidden hinges, rounded corners and all. Apple was late to that style. Apple modeled that style from a line of popular French kitchen appliances of the era. I love this video. The current on the cathodes was impressive. “…nighttime emissions” not to be confused with “nocturnal emissions”. Or maybe Dan is having a little fun with us? WLW at 500 kW was high powered but was eclipsed by Radio Luxembourg which raised its power to 1300 kW for broadcasting to the UK. For many years it was the only commercial broadcasting station which could be received throughout the UK. One of Radio Luxembourg’s commercial competitors, Radio Monte Carlo, was (is?) capable of 3000 kW. Not needed nowadays because most people listen to radio on FM or DAB. Half a megawatt of broadcast power is practically electronic warfare! The anti-ballistic-missile radars at RAF Fylingdales are barely more powerful at about 800kW each, and even in their remote site they have caused problems for localas. Yes, that’s 800kW in each of three 120 degree sectors for a total peak power output of 2.4 MW…nearly 5 times the output of WLW at its peak. WLW used a vertical ground-plane antenna with an omnidirectional pattern until the second phased vertical was added to modify it to a cardiod pattern to reduce interference. Second, the RAF installation is merely a tracking radar, not an offensive system. The radar doesn’t actually down the missile; it merely tracks its location. Not exactly electronic warfare. For much more on Crosley broadcasting, its successful war effort and especially the automobile division, click into http://www.groups.yahoo.com/group/Crosley and http://www.facebook.com/CrosleyCarClub for articles and thousands of photographs. It’s all free, and Crosley ownership isn’t necessary.